Many of the records maintained in America’s courthouses—records that historians and some other fields generically call “primary” sources—are duplicate originals or record copies rather than true originals. Does it matter? For the next several postings, we’ll consider the processes that created these legal records, the reasons why differences matter, and characteristics by which we can recognize the type of record we are using. Federal Rule 1002(4), defines a duplicate original as "a counterpart produced by the same impression as the original, or from the same matrix, or by means of photography, including enlargments and miniatures or by mechanical or electrical rerecording, or by chemical reproduction or by other equivalent techniques which accurately reproduce the original." In everyday practice, this definition includes the digital images and microfilm often used by historical researchers. Under Federal Rule 1003, in most circumstances a duplicate would be as admissible as the original. For our own research purposes, that uusally holds true. However, Federal Rule 1003 also mandates that the presenter of a duplicate is obligated to explain why the original is not submitted. Careful historical researchers make that distinction also. To do that, we need to understand the processes by which records were created and maintained. 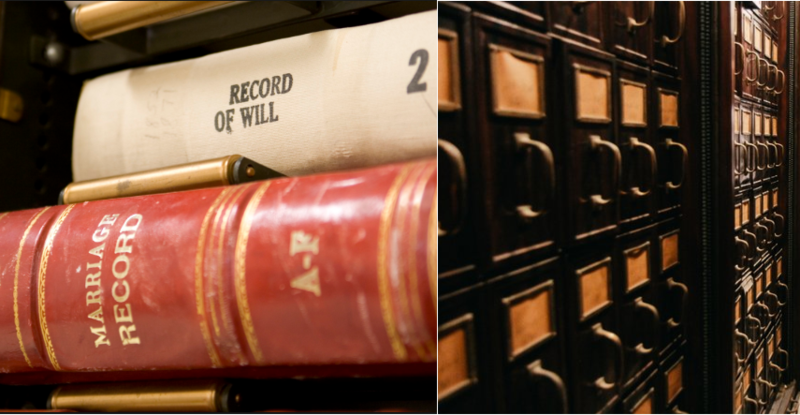 Historically, attorneys presented the court with documents critical to the case at hand—contracts, depositions, petitions, probate inventories, etc. Early Americans who acquired or bequeathed property (as well as witnesses to those records) also brought deeds and wills to court, acknowledging their own personal actions or attesting the validity of a signature they had witnessed. Sometimes we find mere references to these in court minutes (the registers in which court clerks made brief notations about what transpired that day while court was in session), but we don't find the documents themselves. In more modern times, attorneys or individuals have presented those property records directly to court clerks, to have them recorded. However ... and this is a big however: those documents presented to courts were not necessarily “originals.” Many were “duplicate originals,” matching copies created more or less simultaneously. Many property owners, who did not want to risk a deed or will being lost, were willing to pay their lawyers (or local notaries or justices of the peace) to make duplicates or triplicates. What happened to those records, once they were brought in for legal processing? Many documents filed in legal suits and probate cases were not recorded. Recorded or not, those originals and duplicate originals might—or might not—have been retained by the clerk’s office. Some clerks, as a matter of practice, returned originals to the “appropriate party," i.e., the purchaser of property or the man who had taken out the marriage license that the minister had returned to the courthouse after he officiated at the wedding. Sometimes we see clerical notations in the record books about the disposition of the document. A crytpic note may say “Delivrd to John Smith” or “doc. 12, bundle 256” (or, more commonly, just "12/256") referring to the office’s own filing system. Loose documents that were retained in the clerk’s office were typically kept in a folded-up form referred to as bundles, envelopes, jackets, packets, and shucks, etc. A one-off document would be folded to envelope size, with a few identifying words on the outside of the fold. A whole court case or probate file would typically be bundled together, under a single file number or name. Some such files were inserted in jackets—or not. In earlier and poorer counties, bundles were simply tied together and shelved. As storage methods progressed, courthouse offices adopted metal filing drawers, sized to hold the bundles upright, protect them from wear, and provide an organizational system. Some of these loose files can still be found in local offices. In other locales, clerks cramped for office space simply tossed their loose papers, on the premise that everything important would have been recorded. More conscientious clerks arranged for bundles to be taken over by an archive or a local library or historical society. In the best of cases, surviving loose files have been microfilmed or digitized. We count our blessings when that happens. When you use a digitized or microfilmed record, do you note whether you are using a “loose document” or a bound register? When you use the recorded version of a document, do you check for marginal notations that refer to a “more original” form? Given a choice between a “loose” document or a recorded one, which would you choose? HOW TO CITE: Elizabeth Shown Mills, "Understanding Courthouse Records: Originals vs. Duplicate Originals," blog post, QuickTips: The Blog @ Evidence Explained (https://www.evidenceexplained/quicktips/understanding-courthouse-records-originals-vs-duplicate-originals : 24 January 2019). I've learned (esp. thru taking the BU genealogical research course) to note whether I'm reviewing a "loose document" vs. a bound register, whether or not I'm in the courthouse actually touching documents or I'm scrolling thru microfilm or digitized images. If I had the choice, and both versions were available, I would want to see the "loose" document and the bound one. The "loose" doc might be "more original" but maybe not, as it might have been one of several copies the deedholder had. Discrepancies between the versions would obviously need to be noted. It all comes back to those timeless questions -- why and for what purpose(s) was the record created in the first place? Might there be another copy somewhere else? And if so, where? Cathmary, you just nailed the two most important words in any researcher's life: Slow down!